Lapfrod Mill Cottage overlooks the courtyard and leat serving the old water mill. The cottage has seperate living and kitchen-dining areas downstairs with a shower room and two bedrooms upstairs with shared bathroom. The kitchen has dining for four at the table, an upright piano for the musically talented(!) and overlooks the mill garden. The connecting corridor leads to the downstairs WC with shower and Sitting Room. The cosy Sitting room has a flat panel tv, sofa and arm chair, and a staircase leading to the upper landing. Upstairs there is a twin room and a double room, both with twin aspect and separated by a second bathroom. The grounds of the mill comprise of a small private wheel-garden, which houses the 12-foot waterwheel, and a further 3 acres of private parkland beyond. Across the road from the mill courtyard is a private half-acre woodland with river frontage with fishing. We are three generations of the Gater family who lived at Lapford Mill from 1425 to 1850. The property has passed through several occupiers and is now back in the hands of the Gater family, namely, Ann J Gater Snr, son Alexander and grandson Connor. Ann is now retired and enjoys working in the garden and planning improvements to the parkland. Alex (48) has spent his professional life working in media and IT, and continues to do so from home in the mill house whilst undertaking the restoration of the water mill and Connor is taking his GCSEs and helps his father with the mill at weekends. Lapford Mill is host to the local music festival Lapstock once a year in the summer and details can be found at the Lapstock website. Lapford Mill is described by Natural England as a rare example of Devon's watermill heritage and is in very good condition, however the water is currently shut off from the mill whilst the watercourse undergoes maintenance. The mill building is available for guests to visit and Alex enjoys nothing more than showing this old gal to interested visitors, however the mill is not open to the general public. Being a watermill, the immediate area is interwoven with water courses, comprising a long mill leat and the Lapfod Yeo river, which is part of the Taw River system, boasting good fishing for trout and salmon. The private park behind the mill is bordered to the north by the mill leat and farmland, and to the south by the old Tarka line which runs a small, two-carriage train once an hour! Across the road from the mill is the private woodland and conservation area, which is bordered by the main river. The property is a detached part of Lapford Mill complex, a private courtyard surronded on three sides by the cottage, the mill house and the mill building. The mill is a rare treat and, though in restoration, a fascinating example of the period. Efficient heating controlled from wifi handset in cottage. All bed linen is Egyptian white cotton. Space for up to two cars is available in the gated courtyard. Sofa, high-back arm chair, foot stool, occasional tables, large flat-panel television with Freesat, cushions. Guests are asked not to put non-stick pans in the dishwasher. Crockery, cutlery, glasses, mugs and casserole dishes. Blutooth DAB stereo radio & speaker in kitchen. Small garden behind cottage containing the water wheel leading over bridge to four acre private park arranged as several fields and pond. Thanks for leaving this review Michael. It was great to meet you both and we look forward to welcoming you back again one day! The Cottage is a wonderful home from home, we were completely settled in in less than five minutes! Even the bad weather that we experienced did not detract from the beauty of the house and grounds. A real bonus was discovering that the main bedroom has a four poster bed which is very comfortable indeed! Thank you for your warm words! It was lovely to meet you all and so glad you enjoyed your stay. Glad you got home safe and looking forward to seeing you again one day! We had a really peaceful stay. It was very rural which was what we wanted. The property was ideal for the dogs, we had 4 acres for them to run in. There are also some lovely walks locally. The house was comfortable and everything seemed to be thought of. I would return and highly recommend it. Alex was very nice and was very helpful. Thanks for your lovely review. It is very helpful to receive these. So glad you had a good visit and we look forward to welcoming you back again in the future! Lovely property in a beautiful setting. The owners who live next door are so kind and welcoming and we had a very interesting tour of the old mill. The property is very cosy and has everything you. need for a perfect stay. The location is very good for access to lots of attractions and walking areas. The village has a lovely pub and a Spar shop. It was great to meet you both and I always enjoy showing people round the old mill building when I get the opportunity, so thanks for coming and I hope to have some progress on the project next time we meet! Pretty, comfortable cottage in the grounds of an old water mill. We felt very, very welcome and the cottage was spacious and fully equipped. Convenient for walking or just relaxing in the beautiful mill grounds. We certainly hope to return. A super mid point location for exploring North and South. Alex made us all feel very welcome and everyone (kids and dogs !) felt very comfortable. The heating was excellent and we were so cosy and slept brilliantly on the extremely comfy beds. The cottage has everything you could need including a much appreciated washing machine as the children enjoyed wading up nearby streams and jumping in the sea fully clothed ! A fantastic stay. Highly recommended. 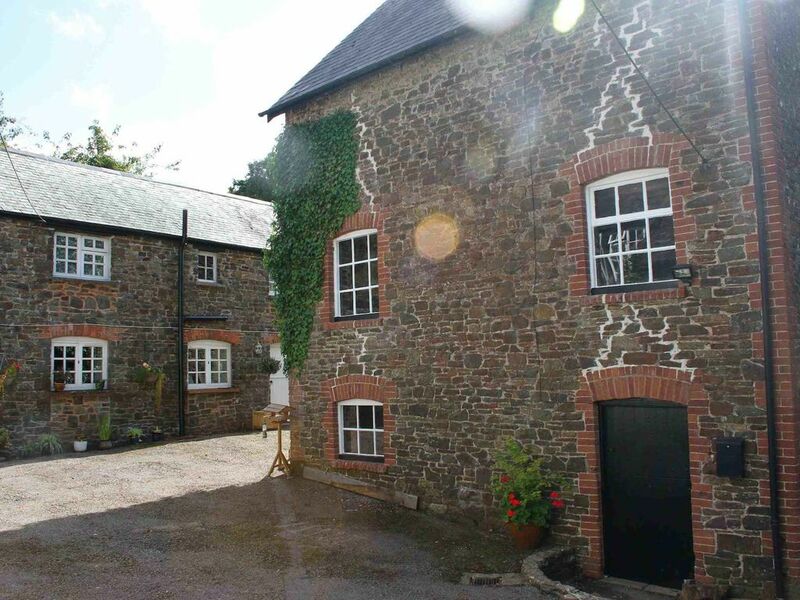 Lapford is centrally located in Mid Devon with good access to both Dartmoor and Exmoor, and nearby to Eggesford Forest. Guests are responsible for their own safety whilst at the property and within the grounds. Adults are required to familiarise themselves with the health & safety information in the welcome pack on arrival.